A user profile consists of the cumulative characteristics of your target audience. For example, it takes age, marital status, income, and place of residence into account. By serving ads based on characteristics, you can avoid spending your ad budget on non-targeted impressions. Crypta technology lets you precisely target your audience. It analyzes user behavior on the internet and determines what particular group they belong to. To do this, Crypta technology tracks the behavior of typical representatives of that group. For example, it looks at what words they use in their queries, what sites they visit, and what time of the day they use the internet. You can read more about Crypta on the Yandex website under the “Technology”section. During the ad-selection process, characteristics entered in the profile work concurrently (using the “AND” operator). The more characteristics you add to a profile, the lower your audience coverage. Enter the gender, age, and income of users you want to serve your ads to. For example, you can serve your ad for a new housing complex to users 25 and older with an above-average income. Keep in mind that targeting narrow groups of users will lessen your campaign's reach. Socio-demographic profiles of users are constructed based on their behavior on the internet. For example, you can determine a user's gender and age if the user entered them in Yandex.Passport or if their behavior is similar to that of users of a particular age or gender. If you have a working site, we recommend using data from the “Demography report group” in Yandex.Metrica. Select the marital status, number of children, and profession of the users that you want to serve your ads to. For example, you can serve your ads for new construction projects to families expecting a baby. Data about one's marital status and profession is based on their behavior on the internet. For example, if a user searches for infant formula and orders taxis with car seats, you can assume that they have a small child. A user's profession is determined based on what professional sites they visit: for example, resources about advertising or programming. Behavioral indicators reflect users' characteristics and preferences. You can specify how often they watch TV, use the Internet, what devices they have, and what kind of car they drive. For example, ads for a new model of TV can be served to users who watch TV a lot or who have a Smart TV. Within one category, behavioral features can be combined using “OR”, or “AND” can be used to combine different categories. Note. Be careful not to confuse behavioral indicators with interests. For example, a user whose interests include Autos searches for information about cars or reads feature articles, whereas a user with the Motorists indicator has a car. Indicators are determined by user behavior on the internet. For example, we assume that a user drives a car if they have created driving routes in Yandex.Maps or have Yandex.Navigator installed on their device. Indicate what interests the users that you want to see your ads have. Interests are determined based on visited sites and the topics of search queries. You can't join more than three interest sets using the “AND” operator in your profile. You can't join more than 10 interests using the “OR” operator in the same set. For example, let's say your daycare ads target moms who want to return to work and need someone to watch their kids. If you select both data types in the same set, your ads will either be served to people who are looking for work, or people who are looking for a nanny. To serve your ads to people who are looking for work and a nanny simultaneously, enter two interest sets. In the first set, select “Nanny” as your interest, and in the second set — “Search for work”. For each set, you must enter the type of interests: long-term (if they have demonstrated continuous interest), short-term (if they have been interested in it for a few days), or both. Short-term interests are updated in real time, whereas long-term ones are updated once daily. You can connect with users with different interests using different ads and set different CPMs for each of them. For example, some users may be consistently interested in traveling, whereas others only started searching for their vacation destination a few days ago. You can let avid travelers know that you're selling plane tickets to less frequented locations and tell people who are ready to buy tickets now about a sale that's underway. 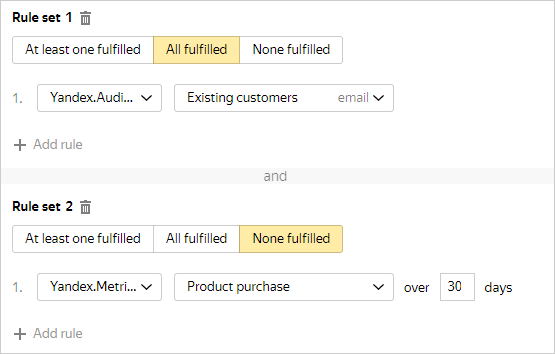 Create two campaigns and target users with different data types. Keep in mind that general interests are broader than the combined nested interests in that grouping. For example, “Music” unites not only those who are interested in musical instruments and concerts, but also those who use online services to listen to music. Using Yandex.Metrica or Yandex.Audience, you can serve your ads to a hand-picked group of users. For example, you can choose people who put something in their basket on your site, customers from your CRM, or people who've already seen your display ad. You can join one or more rule using the “AND” operator (but not more than 50). In one set, you can use Yandex.Metrica goals/segments, Yandex.Audience segments, or a combination of the two (without exceeding 250). Keep in mind that the more rules you set, the lower your audience coverage. The system lets you specify the extent to which rules are fulfilled — All fulfilled, At least one fulfilled or None fulfilled. You can not enter a rule set with the None fulfilled condition as the only characteristic in your user profile. For each Yandex.Metrica goal or segment, set a period between 1 and 90 days. Ads will be served over that period to an audience that fulfills the criteria you specified. Yandex.Audience segments are automatically updated regularly, so they contain current user data. For example, you can serve ads for discounts to existing customers who have not made a purchase on your site in the last 30 days. Yandex.Metrica and Yandex.Audience data will factor into the ad-selection process along with the rest of the user profile characteristics (using the “AND” operator).